CHINA MAMA has returned from the dead. If you’re wondering where it went, well, that’s a story as inscrutable as a Mandarin soothsayer. 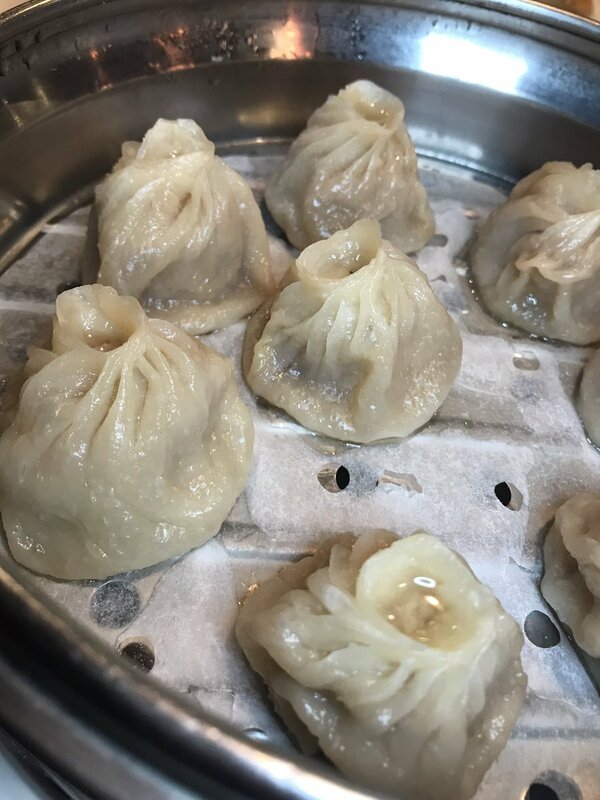 Those of you who remember our burgeoning food scene of a decade ago may recall China Mama as the first progenitor of authentic Shanghainese dumplings — xiao long bao — those soup-filled pillows of ethereal porcine bliss. 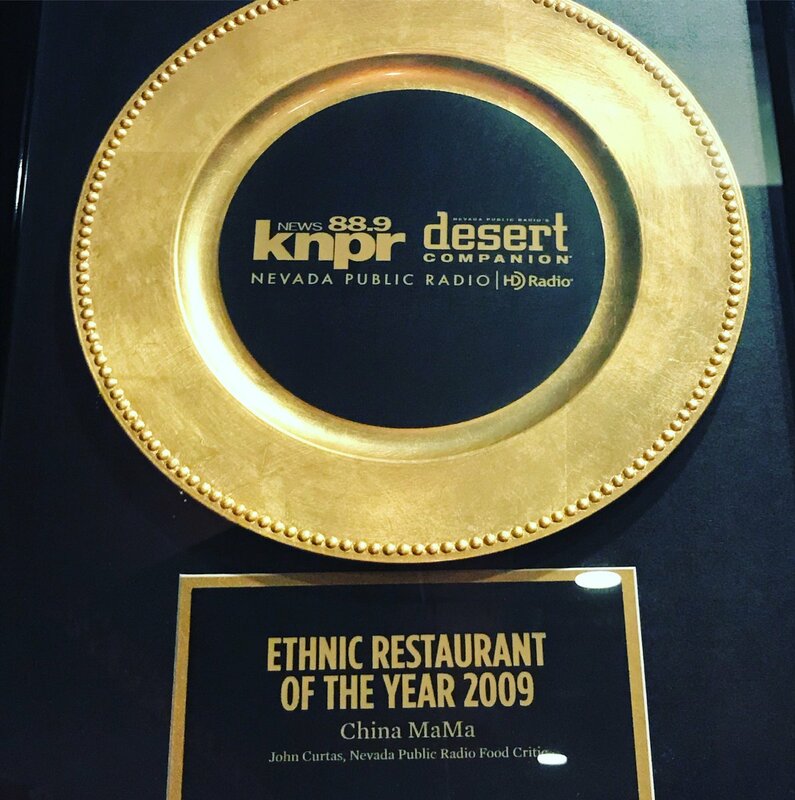 In much the same way as Lotus of Siam was the first authentic Thai restaurant in Vegas, CM brought a taste of real China to our doorstep — things like sliced-fish with pickled mustard and dry-fried pepper chicken — cooking well beyond cornstarched glop of its Chinese-American predecessors. And then there were those pastries and dumplings. Steamed or fried, or filled with pork or cucumber and shrimp, they were all the rage among intrepid foodies for a good five years. Chefs moved on (the siren song of the Strip claimed the first one), ownership changed (more than once), and the food started a slow, steady decline. Of course, if you asked management if/why things were different, they would look at you with a straight face and say, “Everything same,” but you knew it wasn’t. Things got so bad that we wrote the place off altogether about four years ago and vowed never to return. 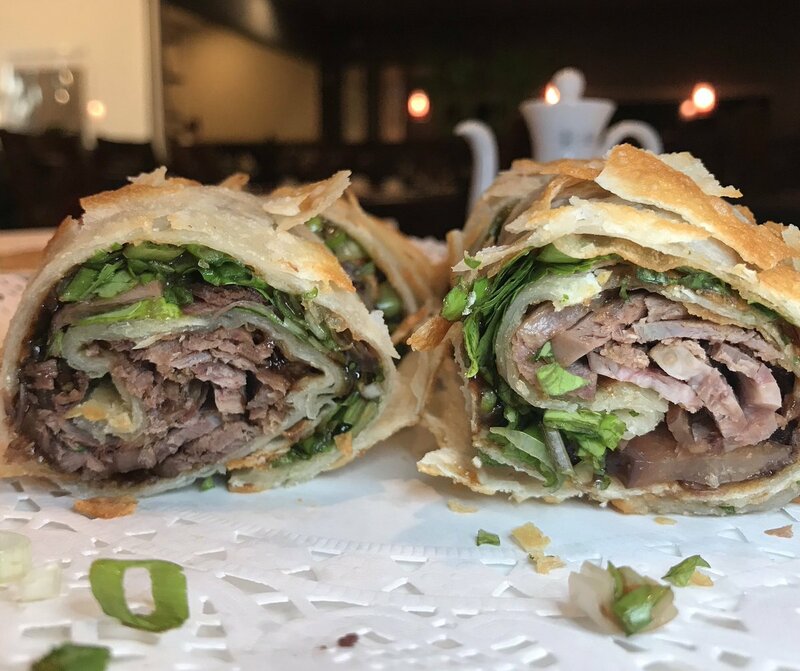 A woman named Ivy Ma took the place over recently, closed it down, spruced it up, and decided to restore China Mama to its former glory. And restore it she has. Taking a page from place like Din Tai Fung in SoCal, Ma opened up the kitchen and placed it behind a giant glass wall that proudly advertises the fresh-made pastries that made this place famous in the first place. 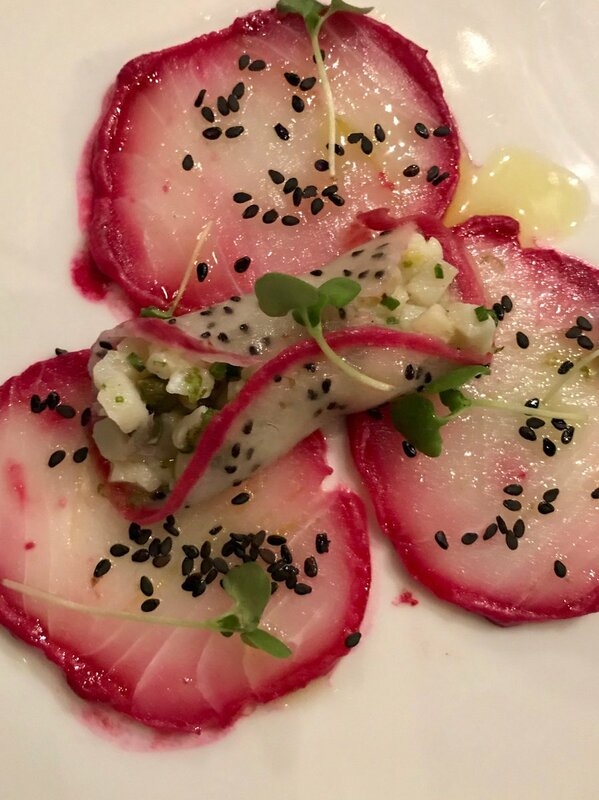 Those dumplings may bring you the first time, but a menu full of fabulousness will have you returning time and again. 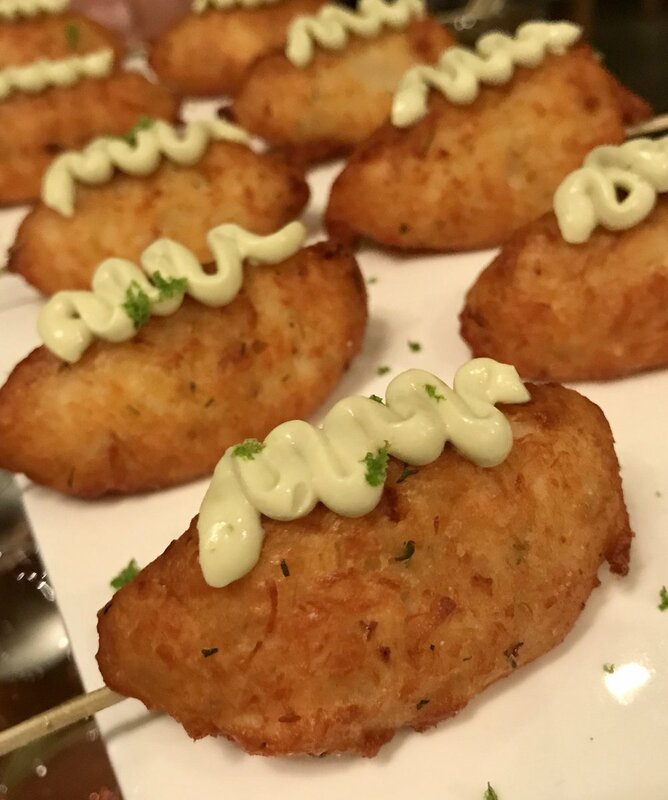 The potstickers ($10) are killer too, but be careful lest you reach gluten-overload and lose your ability to dive into a resuscitated menu that’s better than ever. Ma has done wise by keeping many of CM’s greatest hits. Crispy duck ($22), Jumbo Shrimp in Special Sauce ($24), and Dry Pepper Chicken $16) hold forth with those pastries and hold their own. There are two sides to the menu, and the one with pictures on it is where gringos will want to go. 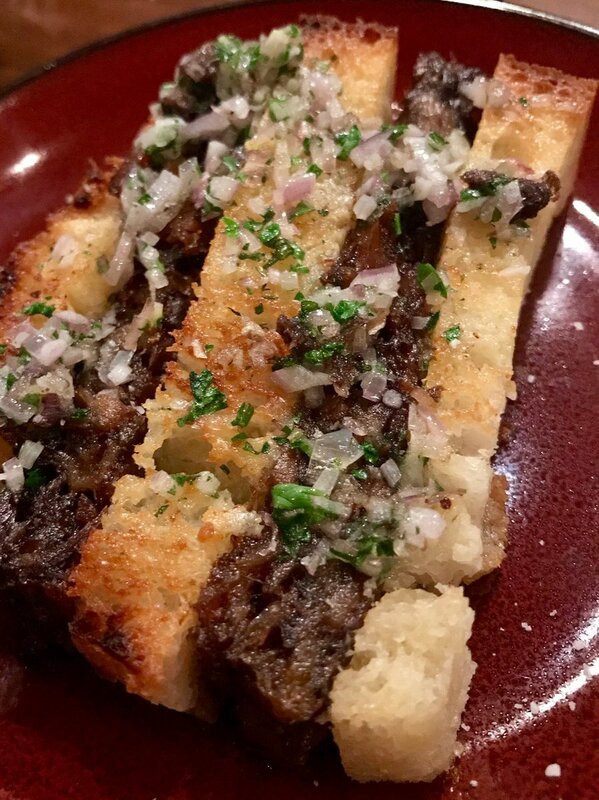 It lists all of CM’s signature dishes, and even has pictures to entice the bold and assuage the timid. Not pictured but still magnificent are items ranging from the simple (Cucumber Salad with Mashed Garlic $6) to the sublime (Awesome Meatball in Clay Pot $19). In between you have plenty of standard issue stuff that still manages to sing (Szechuan TanTan Noodle, $10, and Twice-Cooked Pork with Spicy Sauce, $13). 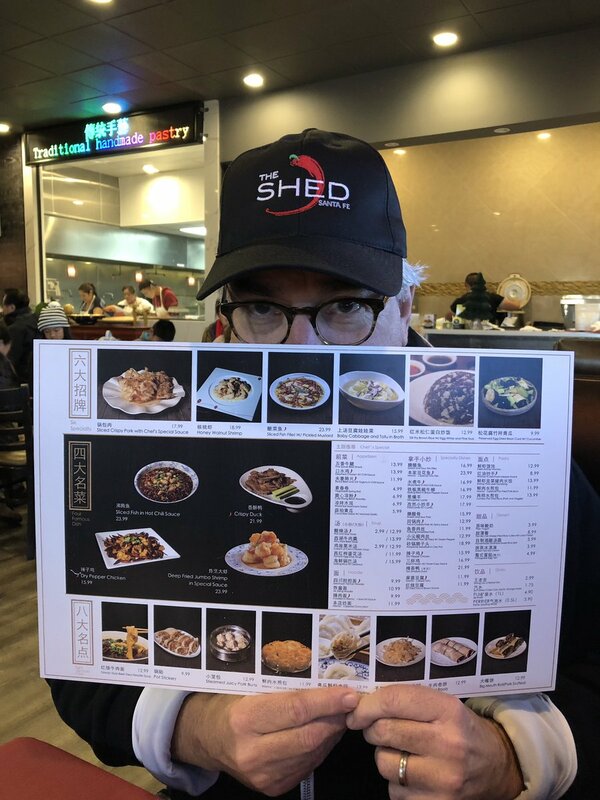 Also highly recommended is the Sliced Fish in Hot Chili Sauce ($24) — a dish that will never be accused of false advertising — it being for serious chiliheads only. All of these dishes are meant to be shared, and in keeping with Chinese tradition (at least as it was explained to me), the number of items ordered should roughly equate to the number of diners at table (2 people, 2 plates; 4 people, 4 things, etc.) 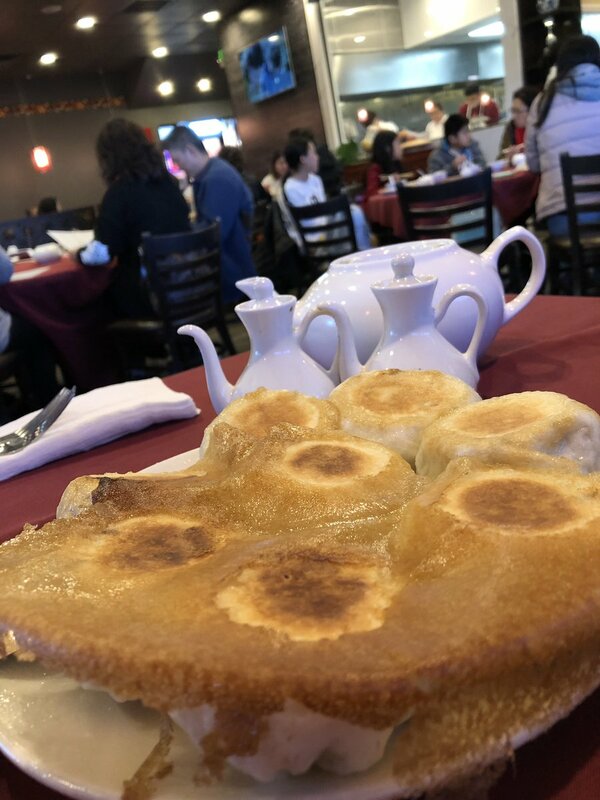 although The Food Gal® and I usually honor this custom in the breach — it being almost impossible for two hungry gwailo to resist some form of dumpling, and at least two other plates. 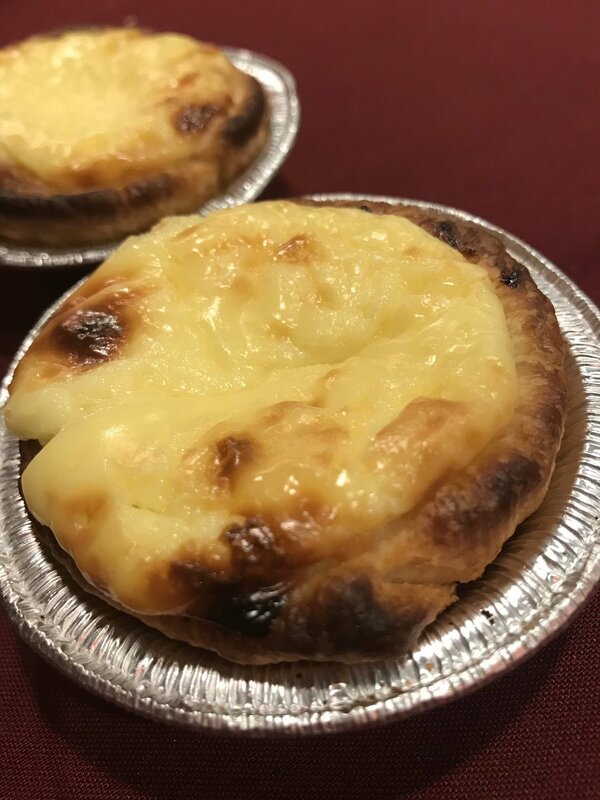 Irresistibly, you will be drawn to the don tot (Portuguese egg tarts, $5, above) for dessert. Resistance is futile so order them as soon as you sit down so you won’t have to wait while they’re freshly made. Order two orders or more. However many you get, it won’t be enough. All of these things taste as good as China Mama used to taste, maybe even better (those tarts are definitely better)….and all of it making for some mighty tasty leftovers. As for service, it’s been spot-on, top-notch, and on-it-like-a-bonnet for all three of our return visits. (And they had no idea I write about restaurants.) Whatever Ms. Ma has inculcated into her servers is obviously working, as they are bi-lingual, informed about the menu, and very attentive. As for liquids, they bring you hot tea, but you have to ask for water. Until Brian Howard had the foresight to place an American gastropub on Spring Mountain Road, this three-mile stretch of “Chinatown” was the exclusive province of all things Asian. Now, it’s where gastronauts go for boutique lettuce salads, beet and green apple tartare, and giant steaks served with a dozen side dishes. Those sides are an homage to the Korean banchan available up and down the avenue, and give a strong hint about how Howard loves to mix and match his meal metaphors. 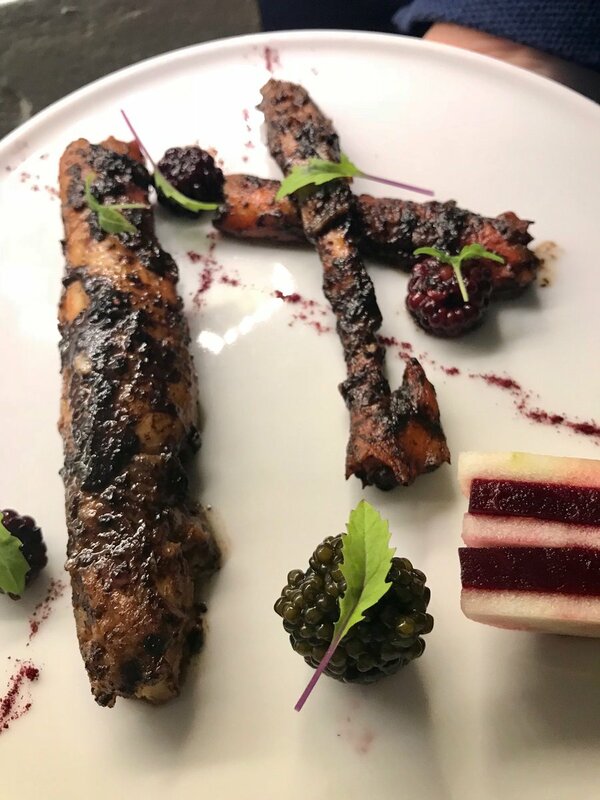 While one table is fighting over an Hamachi collar, another may be torn between the lamb neck with herb crêpes, scallop robata, or Chinatown Clams Casino. By making Sparrow + Wolf our most interesting restaurant, Howard did more than just fuse a number of cuisines. 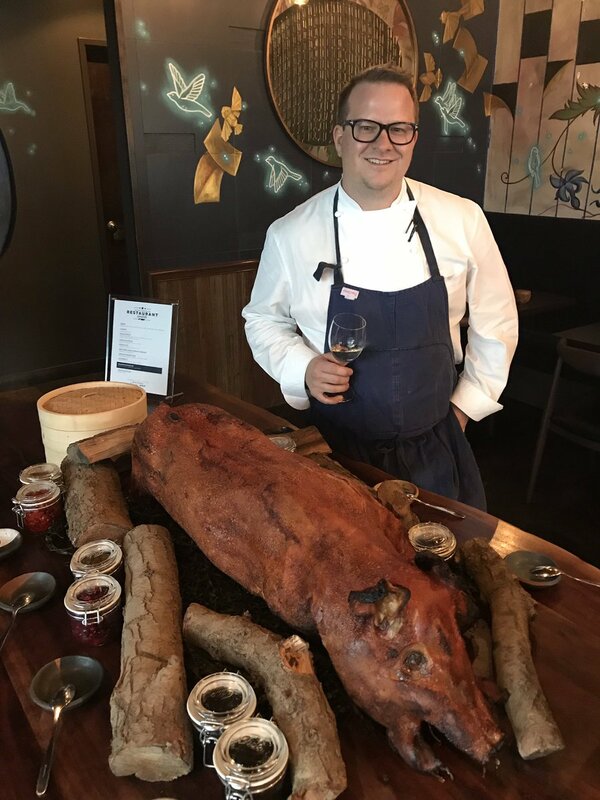 He bridged a great divide between our various gastronomic cultures, inspired others (Partage, Mordeo Boutique Wine Bar, EDO Gastro Tapas & Wine) to follow suit, and turned this neighborhood into our number one dining destination. A Francophile’s dream come true. The chefs are French, the decor is French, the bartenders are French and the food is as French as Bastille Day. And the whole enchilada is in Chinatown. Go figure. 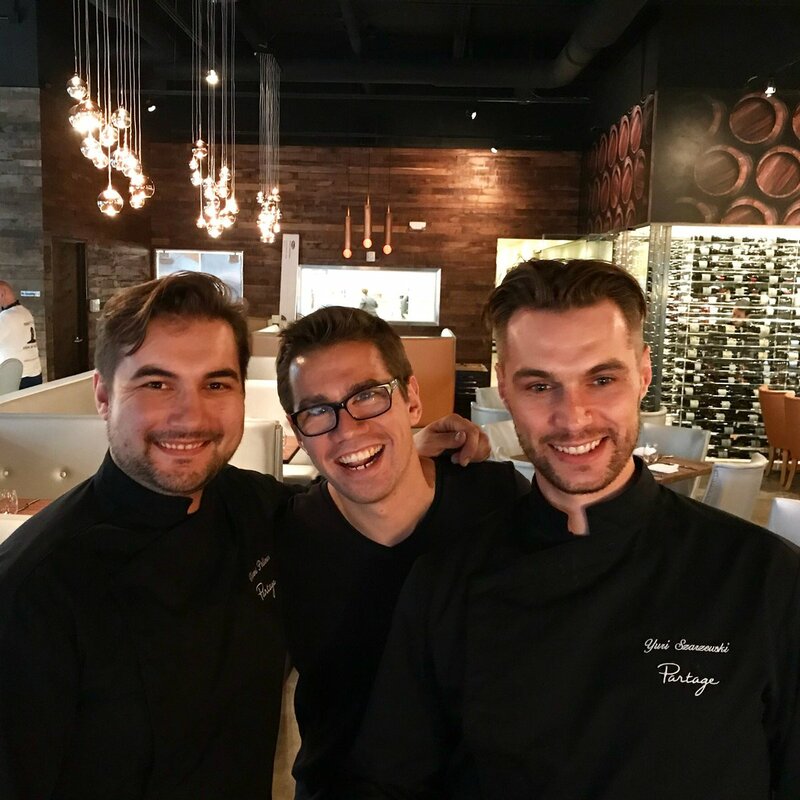 When Vincent Pellerin, Nicolas Kalpokdjian, and Yuri Szarzewski (above) came to the United States in 2015, they had a dream — they wanted to bring healthy French food to Las Vegas. Anyone with a brain would’ve told them the idea had as much chance for success as a Mormon nightclub, but arrive and succeed they did, first with their casual EATT Gourmet Bistro on West Sahara, and now with a more upscale (but still very laid back) place in a shopping center more at home with massage parlors and noodle shops than croque monsieurs and Pays Nantes. The signage is as simple as the storefront and gives not a clue as to the wonders behind the long glass facade. But as soon as you step through the doors, you can sense that magic is about to happen. Seating are plush but not too so. Cozy booths line one side of the room and a long L-shaped bar dominates the other. The lighting is dim (but not too dim) and flattering, and even at peak occupancy, you can still hear yourself think and talk. …and the squid “risotto” — the risotto in this case being finely diced pieces of squid bound together by a barely-there pesto, filled with flavor but not filling you up. Jamon platters are everywhere, but this little one may be the cutest of the bunch. The anti-ham crowd will enjoy digging into things like ratatouille-stuff squash blossoms, burrata Caprese salad, a melange of root veggies, and the best damn pea soup you’ve ever slurped — this one given a kick by lemon-basil sorbet and finger limes. Large groups will want to go large format with big cuts of 18 ounce rib eye, or a 32 ounce tomahawk steak — smoked with either hickory, applewood or hay (your choice!). Two pound lobsters and whole duckling breasts served on the bone, and sea bass baked in salt crust is also offered for the whole table to swoon over. In keeping with the “healthy French” thing, sauces are kept to a minimum. Not to my taste, exactly — the duck, pork and bass suffer from the lack of liquids — but the presentations are in keeping with how modern French food is done these days. Desserts are a dream, and Pellerin’s rolling cart (above) is not to be missed. 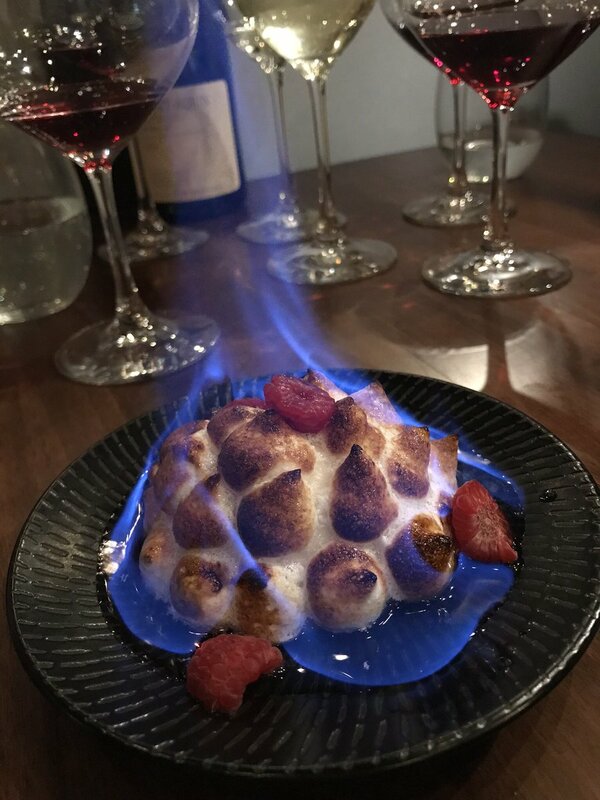 Whether he’s doing a baba au rhum (injected at table with some high proof spirit), a caramel candy bar, or a flaming baked Alaska (below), you can be assured no one, in any neighborhood in Vegas, is eating a dessert as good as the one you’re getting. 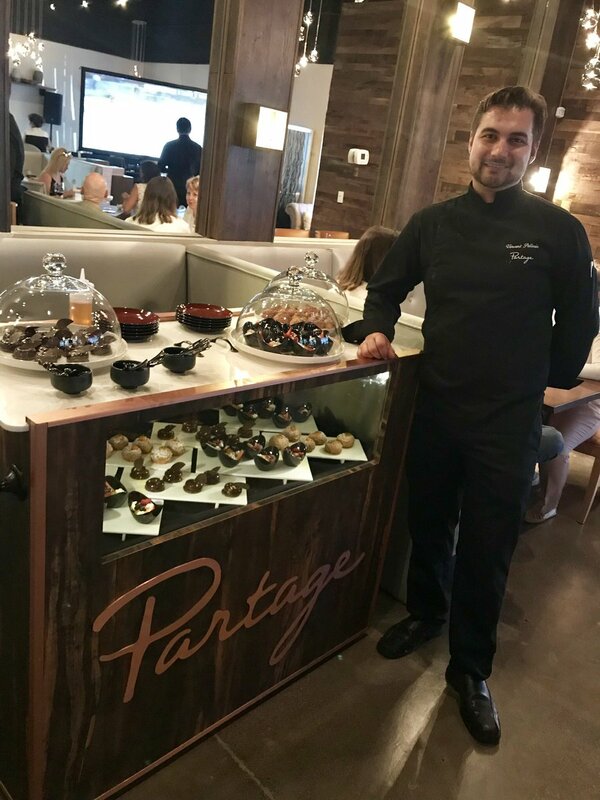 Pastry chefs are an endangered species these days, and having one as accomplished as Pellerin working in the ‘burbs is quite a statement for a local joint. His macarons (when available) should be ordered by the dozen. 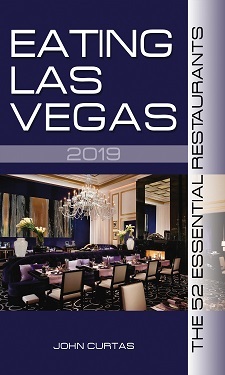 Las Vegas came of age as a restaurant town in 2018, and exhibits 1-4 are Sparrow & Wolf, Mordeo Wine Bar, EDO Tapas, and Partage. By recognizing the true foodie potential of Chinatown, these venues have broadened its horizons and done the same for serious gourmands — local and tourist alike. 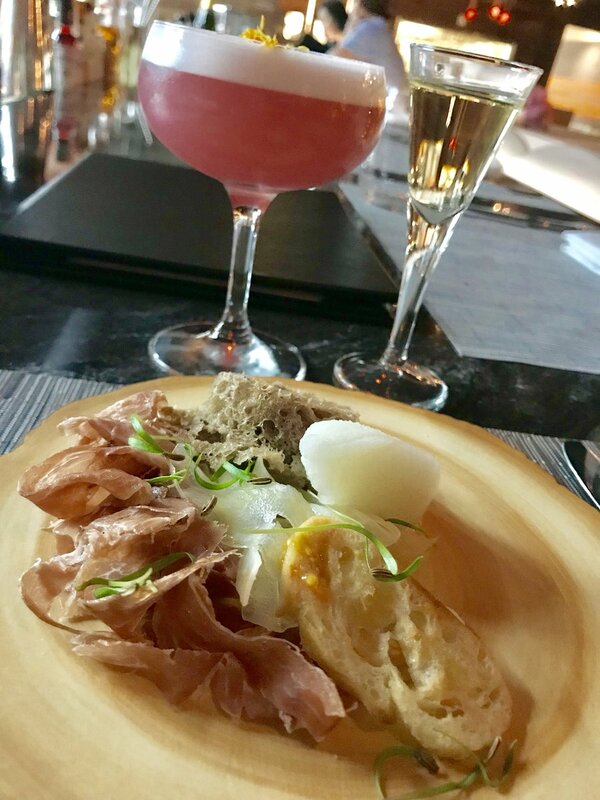 Partage may not be for everyone (the food might be a little too precious for the meat and potatoes crowd) but it’s given a boost to our dining scene in all the right ways. Vive la France!